What’s Going on at WRC in May? There’s so much happening at WRC this May! See below for some congratulations to all those that ran Boston and other recent races, information on our Pacers shopping event THIS THURSDAY, updates on track workouts and race teams, opportunities to volunteer and of course an invite to our monthly fun run. Long Run–As always, the Sunday long run starts at 8 am on the corner of 33rd and M in Georgetown. Meet for coffee at Dean and Deluca after the run. 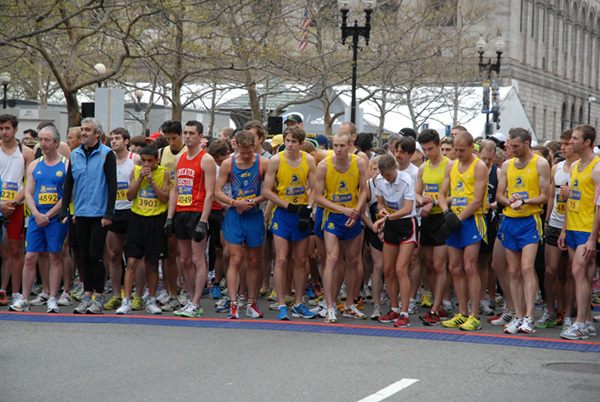 Congratulations to all of you who ran Boston. We had some amazing WRC finishes! Also, Emily Cupito came in 7th at the Frederick Marathon, clocking a 3:30:20 in oppressive heat. Matthew Gerke ran the Tyler Arboretum 10K Trail Run in 48:17, the MCRRC Difficult Run XC 8K in 40:15 to earn 2nd in his age group and 17th overall, and the EX2 Spring BYB Race #4 in 1:15:43 to earn 6th in his age group and 15th overall. The Pacers Store in Clarendon is hosting a WRC shop event on Thursday, May 6. That night only, WRC members get a 20% discount on apparel and 15% discount on shoes. Since Pacers is expecting a fair number of runners for their fun run that night, they asked that we provide a list of WRC members attending the event so that only WRC members get the special discount. If you plan to attend, please email Amanda Hamilton at AmandaH@washrun.org so that we can make sure that you get the special discount. In addition to the shop event, Pacers will be hosting a Brooks Fun Run starting at 7pm, where runners could win prizes such as free running shoes. This week’s theme is a costume run, and Pacers will be giving out prizes for the best costume, etc. If you would like to attend the fun run, please arrive at the store with enough time to shop before the Fun Run. After the Brooks Fun Run, Pacers invited to us to join their Happy Hour. Pacers’ Team Physical Therapist, Robert Gillanders DPT, will also be at the store giving free injury screenings from 6:30 pm to 8:00 pm. Rob will spend 10-15 minutes with you (one on one) and recommend stretches and strength training techniques to address your specific needs. First come, first served. It’s going to be a fun filled night at Pacers, and we hope to see you all there. The track workouts at Cardozo High School and American University are on hiatus while members are recovering from Spring marathons and the racing season. We hope to bring the track workouts back the week of May 15th. Please check our website http://www.washrun.org/weekly-runs/track-workouts/ for updates on the track! When we return to the track we will no longer be sending out track workouts on the listserv and will instead post the track workouts on the website. For more information on track workouts, please contact Amanda Hamilton (AmandaH@washrun.org) or Emily Cupito (Ecupito@gmail.com). As alternative to the track, WRC members are invited to join the Dojos of Pain’s interval workouts on Tuesday mornings and tempo runs on Thursday mornings at Hains Point. The group meets near the National Park Services Office (970 Ohio Drive Southwest, Washington, DC) at 7 AM on Tuesdays and Thursdays. To confirm that a workout group will be meeting on any given Tuesday/Thursday, check dojoofpain.blogspot.com the night before. For more information, please contact Dan Yi (daniel.yi@gmail.com) or Brian Savitch (bsavitch@gmail.com). With the racing season in full swing, the Capital Hill Classic (http://www.capitolhillclassic.com/) is less than 2 weeks away! WRC is fielding a team this year, and the more the merrier! When you register for this race, please be sure to identify “Washington Running Club” as your team. Please note: there has been at least one instance where someone has registered for the race, but not appeared on the official team listing (that would be your fearless team coordinator…) A day or two after you register, please confirm here: http://www.runwashington.com/ that you appear on the listing for WRC — if you’re not there, please let Cris know (cristinab@washrun.org), and she’ll work to straighten it out. 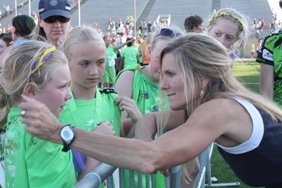 Girls on the Run is looking for volunteers to help out with their 5K on Sunday, May 16, 2010 at American University. Here’s the link to sign up as a volunteer (http://www.surveymonkey.com/s/TZ7KV8Q). If you’re interested in running the race, here’s the link to register: http://www.active.com/framed/event_detail.cfm?CHECKSSO=0&EVENT_ID=1843024. Thanks to everyone who attended April’s Fun Run. It was a great opportunity to meet new and potential members while enjoying a nice jog through Georgetown! Our next fun run will be Wednesday, May 19, 2010 at 7pm. Once again, we’ll be meeting in front of the Logan Circle Lululemon (1461 P Street NW). We encourage WRC members come along and bring friends and colleagues to May’s fun run! If you have any questions concerns, ideas, or just want to chat about running, you can reach us at elyse.braner@gmail.com and tammaanne@gmail.com. We would love to hear from you!